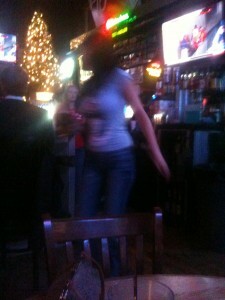 Ahh, nothing like a good ole familiar barspot to round out the year and watch some major championship games. This will be our third year in row heading to the Brooksider Bar & Grill and it’s well worth it. We’ll go over this year’s additions as well as revisit some of the amenities that make the Brooksider to place to be for sports watching. Most importantly however, we have the SEC and the Big 12 Championship game to buckle up and ride along with. So hold on and we’ll tell the tale of the year’s last barspot. This time around the first thing we noticed was how open the joint was. We can’t remember if it happened last year or not, but the they knocked down some walls to make it more open and pleasing. 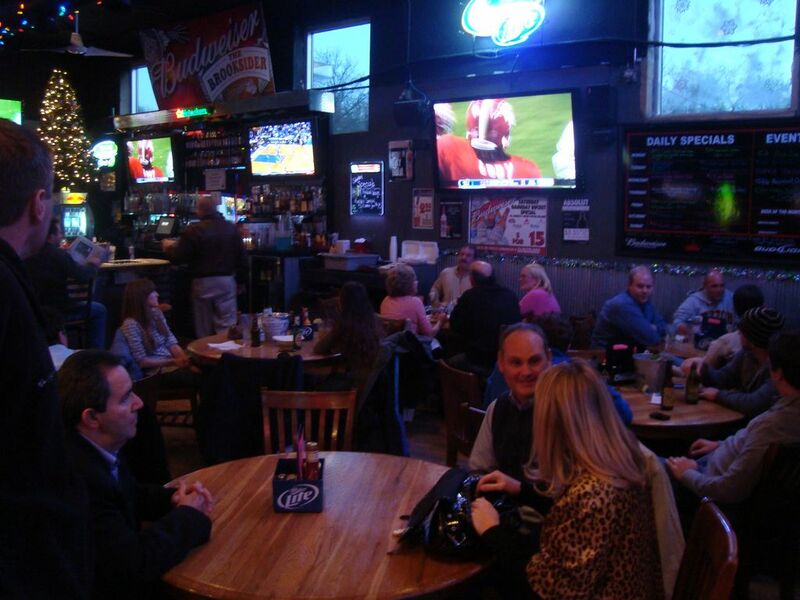 We swear they added even more flat screen televisions since our last appearance. And, yes, we still love the 71 inch plasma television. They added wireless and we were rocking it for the post during the games. There’s nothing else new we really noticed. 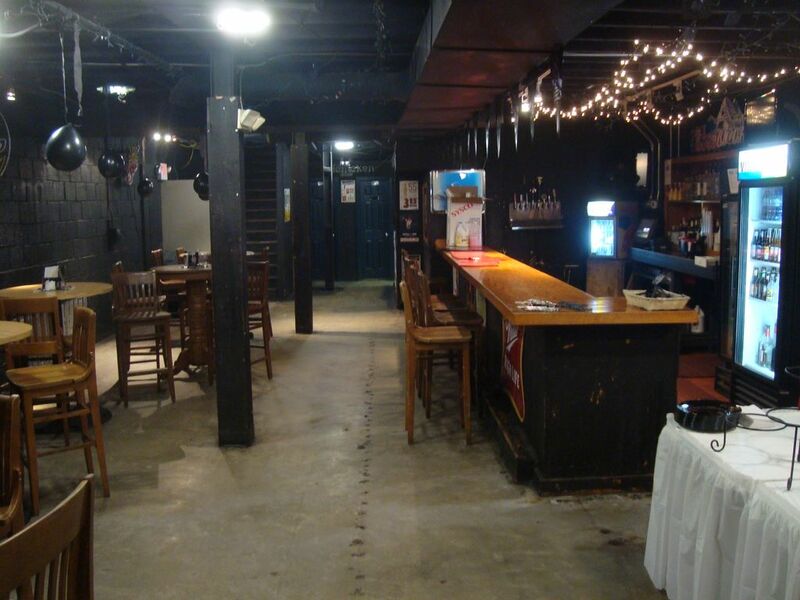 They still have plenty of space for smoking outside, dancing downstairs, and local bands up front. The Brooksider wasn’t without its faults, however. We understand that fans are needed to circulate air, especially in smoking joints, but it was little ridiculous in this kind of weather. Speaking of which, the front door kept opening up and letting in some wickedly cold air. For their next expansion they need a breeze way. Downstairs used to be the place where the dancing and partying took place, but it’s all gone now. Thank you dress code. To make up for it, they have special parties booked down there, but when we were there it was empty and smelled like sewage. Clean it up, guys. The service started out really cool. The first shift waitresses looked pretty cute and they did do a good job of taking orders and accommodation our sitting needs. The 2nd shift waitresses met the standards the Brooksider set as they all matched the beauty we remembered from last time. Although it was a little troublesome when they didn’t know all of the bottles available for the special, they still hooked us up when we needed. 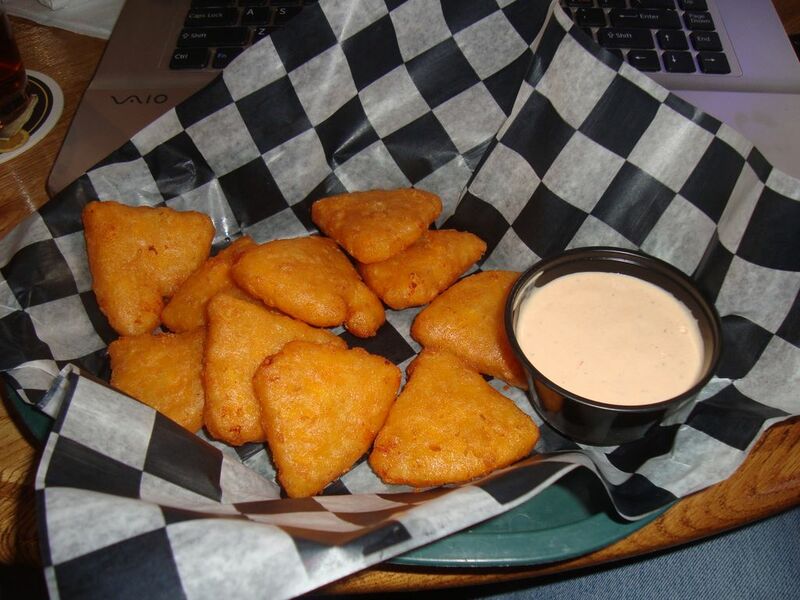 The food always starts with Mac N Cheese Wedges at the Brooksider. We ended up washing it down with their game day special of 5 bucket beers at $15. Get the imports for that deal when you come. It was hard to overlook the $5.99 wing special but the wedges always warms our bellies well. 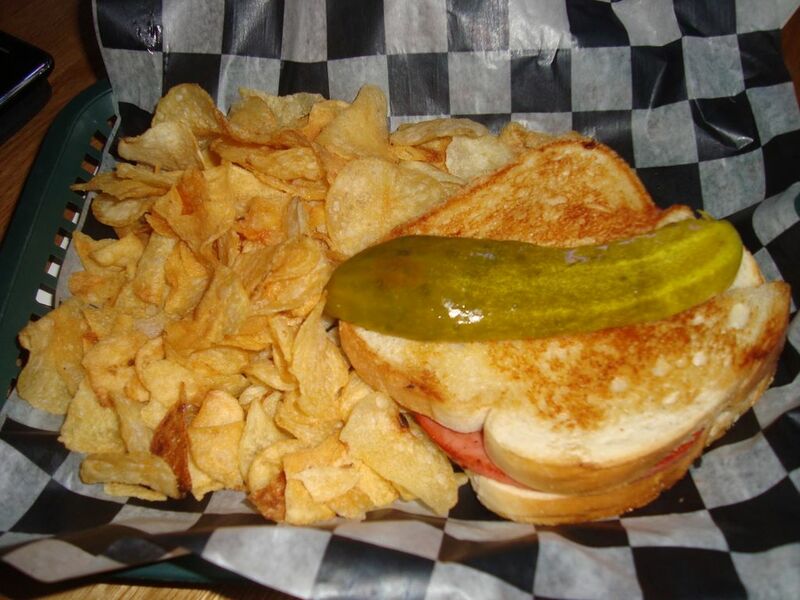 For the second round of foodstuff, we filled our tummy with some fried bologna on toast. It was tasty, but it still doesn’t beat Harry’s Country Club. We showed up early to knock out a good seat and we were glad we did. We spied the dramatic finish of the Big East title game with 2 touchdowns below 2 minutes to go in the game. It was a shootout all day but Cincinnati pulled out at the end to finish with an undefeated season. We were also fortunate to check out the finish of the Fresno State and Illinois game. A 2 point conversion off a touchdown happened after a deflection and a lineman catch. Already the day started out great. But we were really there to see Florida take on Alabama and Texas take on Nebraska. First up, Florida and Alabama locked horns in the in the SEC title game. It was all Alabama to begin with as Mark Ingrim ran all over the Gator D and Florida had a hard time answering. Florida finally put some points with a field goal around the end of the 1st quarter. Tim Tebow and company tried to keep up in the 2nd quarter, but couldn’t match Alabama’s running game. The Crimson Tide pulled away in the third and their stingy defense was just too much for Tebow to handle. The Gators were outmatched and the better team in Alabama won. Contrats to them. 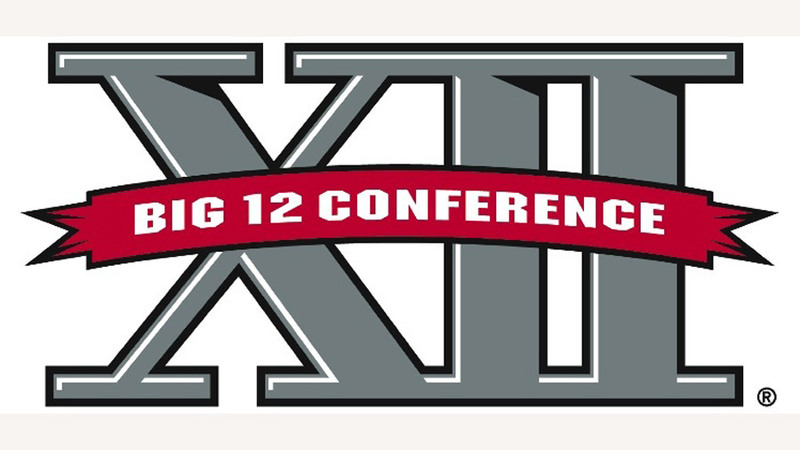 Next up was the Big 12 title game with Texas and Nebraska. The first half opened up with a couple of costly turnovers for Colt McCoy and the Longhorns. Not to be outdone, Zac Lee lobbed a couple of ducks Texas’ way. It was field position that was the factor as Nebraska took advantage of the turnovers and went up on top 6-0. It took some whittling down, but Texas came back toward the end of the first half and scored on a McCoy draw to cap off a long drive. Not much action for the first half as it was Nebraska’s style of play all the way. The second half continued in that tradition and it led to a shocker of a finish. We could talk about the third quarter, but the best part of the whole game ended at the end. After a kick return back into Texas’ territory, Nebraska finished again with a field goal to take the lead late. The kickoff wobbled out of bounds and Texas started with the ball and under a minute to go at their own 40. After a horse collar tackle and a couple of plays, it was down to the last couple of seconds of play. Colt McCoy took the snap in the hopes of running down the clock. He floated the pass out of bounds with no time left on the clock. Or was there? After a review, the Longhorns did have one second. The kicker for Texas lined up and punched in a kick at the end of the game to beat Nebraska and put Texas in the BCS Championship game. Instant Classic. 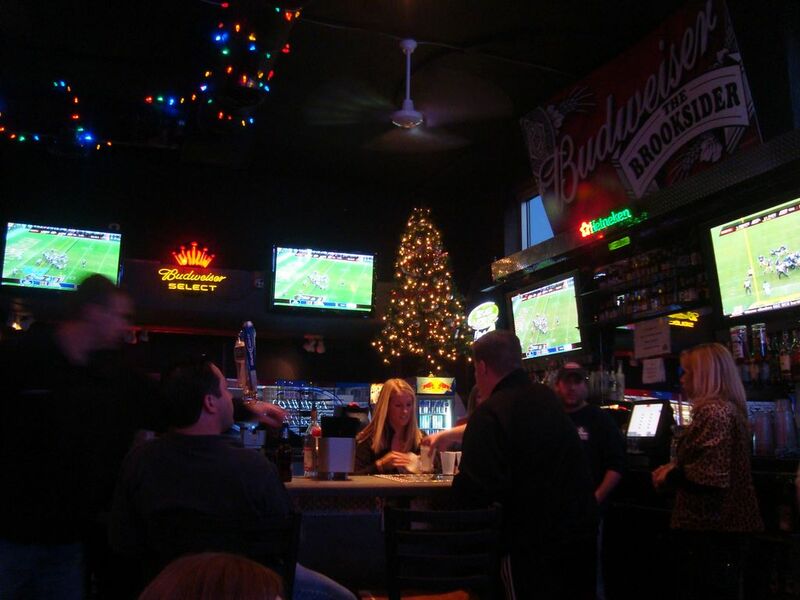 The Brooksider Bar & Grill lived up to expectations, but they are starting to get a little shaky. 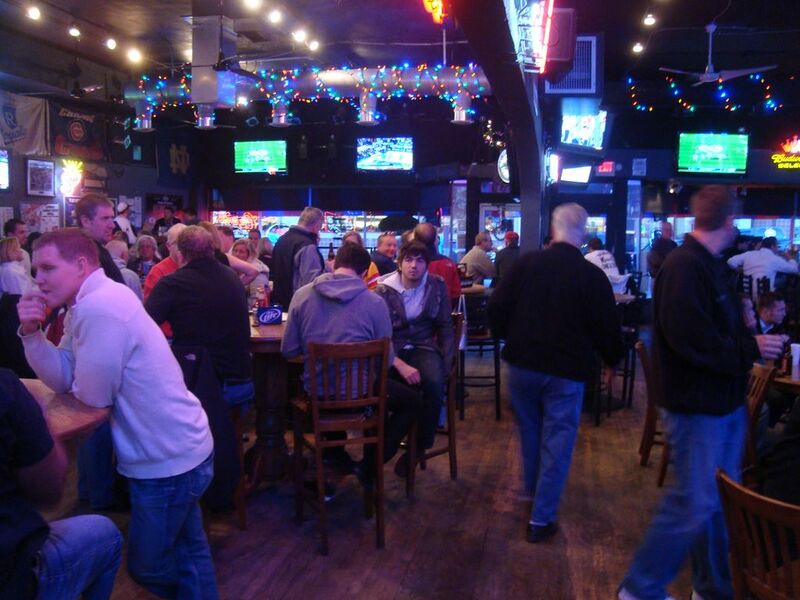 Places like Johnny’s Tavern in the Power & Light district is coming up fast to match their stellar service. As for the BCS College Football Championship, we now have a clearer picture. Bowl Season is just upon us and we’re hoping that all of the games are exciting as the majority of the games over the weekend. Hopefully, our breath will be caught up in time just to lose it again. Kansas State’s lawyers are bringing the full “he said, she said” stating that no such attempts were made to quiet Ron Prince, which his lawyers accused the school of. This is a real bad case of a coach and school parting ways. It’s only gonna get worse. Please remember to hug a coach and a school official today. Backup Nebraska quarterback Cody Spano is out for the year with a torn ACL. The Husker’s projected starter is Zac Lee and if he goes down there really is nobody left behind him. Plus, it’s his first year as a starter. Husker fans need to hope Zac stays healthy if they want to live up to the pre-season hype of a projected Big 12 North title. 15 Duke football players have symptoms of the swine flu. Usually colds and flus make their way through teams and then move on. What’s interesting about this article is that Heather Dinich called it the swine flu. Not H121. Way to go Heather! We like realistic names and not ones deemed okay to say by Congress. Oregon football players (or as new ESPN sportscaster Jon Gruden calls it, OrEEgon) are now wearing cameras on their helmets during practice. The more tape, the better. Our guess is the next step in the evolution of video games will include this footage. Then, in turn, football players could practice by playing the video game. Geekery abound! Colorado cornerback Ben Burney had his blog axed after the first draft. Being the blogging realm we are disappointed to see such speech revoked. Although the kid probably shouldn’t have touted how well in the sack he is. That’s not quite the inside look people are looking for in football. New Mexico State is asking fans to pitch in for snacks for the football team after practice. Seriously? We know the economic downturn is affecting everyone, but what’s the deal with a school not springing for orange slices and Capri-Sun after a workout? Mike DeArmond from the Kansas City Star profiles Missouri’s defensive secondary. They were the worst in the Big 12 last year and are looking for a turnaround. With many of the offensive players from last year drafted away to the NFL, the defense needs to step up and help shoulder the load (and transition). Speaking of defense, bot the Topeka Capital Journal and the Manhattan Mercury talk about Kansas State’s defense. There’s no place to go but up for the defense as they ranked below 100 in the terms of total defense last year. 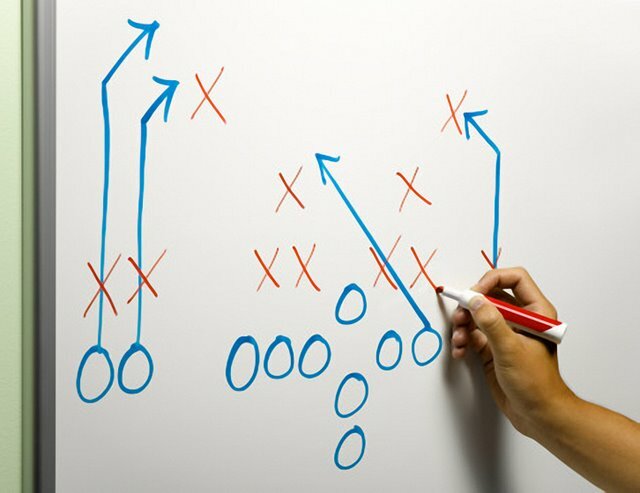 To help the attempted turnaround, they are featuring nickel defense much more this season. Hopefully that will help counteract the explosive offense most of the Big 12 teams bring into the year. Former Duke basketball starter Greg Paulus will now be the starter for the Syracuse Orangemen. We’re not sure if it’s because he’s super talented (he was a five star football recruit in high school) or if the rest of the quarterbacks on the team stunk. At any rate, the school will sell more tickets because of this guy and that’s a good thing. Former Rivals #1 recruit Bryce Brown and Tennessee are under investigation by the NCAA for alleged violations in his recruitment to the university. The question is whether funds raised for Brown’s trip out to Tennessee was legit or not. Brown, a Wichita native, tread the news waters earlier this year when he was waffling back and forth between schools after his commitment to Miami expired, including Kansas State. This guy smells like trouble and chances are he won’t turn out well.